The invention by Torq Labs tracks leg movement using five sensors, with help from a smartphone app. Torq Labs won a booth at the Avantex Paris fashion-tech show after earning first prize at the previous show in September. Avantex focuses on high-tech fabrics, especially those that integrate digital technologies. 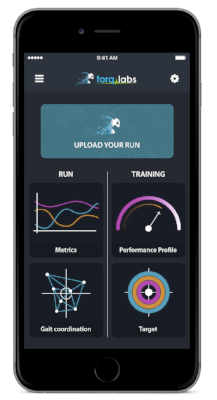 Torq Labs K-tech sensors, placed above and below each knee and at the sacrum, wirelessly send data on movement and location to the runner’s smartphone, which searches for telltales associated with lower body injury. The information is designed to help improve the user’s coordination and balance, says co-founder Julian Holtzman. “We are looking for gait imbalance and movement asymmetry, such as taking a longer stride on the right or left,” says Holtzman. “Some runners kick one foot sideways, instead of focusing on forward and back movement. They may have a wobble or a slight collapse at the knee as they land on that foot. Many of these asymmetries or compensations are recognized precursors to injuries, but the runner is often unaware of them — and a running coach is seldom around to notice, either. “A triathlete coach told us, ‘I send them out to run six or 10 miles, but I am not with them, so I cannot see their gait,’” Holtzman says. The idea for a motion analysis system was born in November 2015 by the six Torq Labs co-founders, five of whom were UW–Madison students or alumni. The technological bases of the system are the declining size and price of sensors and the boom in Bluetooth connectivity. The system also had roots on soccer fields, where Holtzman and Josh Theirmann, another co-founder, have had significant injuries. If the movement threatens to weaken or damage the leg, “We encourage you to take action to reduce the risk of problems,” Holtzman says. Through work in Paris and on campus at UW–Madison, the company developed the sustainably sourced prototypes it showed at Avantex Paris in September and continues to refine. Torq Labs demonstration video of K-tech sensors in use. The information is intended to improve the user’s coordination and balance.